Presenters Hilary Reed (top) and Hannah Richards (bottom) at the Maine CU Marketing Council Spring Workshop. Credit union marketing professionals from across Maine gathered in Freeport on Tuesday to network and participate in the Maine Credit Union Marketing Council Spring Workshop. Attendees heard from two industry professionals who each addressed timely and relevant topics facing today’s credit union marketers. Hannah Richards, Content Marketing Strategist at Ethos Marketing, kicked off the day with a session on how to develop content people will read. She outlined how to develop a persona and spoke to the importance of creating tailored content for specific stages of communication: awareness stage, consideration stage, and decision stage. Hannah closed her session with a group exercise highlighting the importance of writing catchy headlines to entice readers. 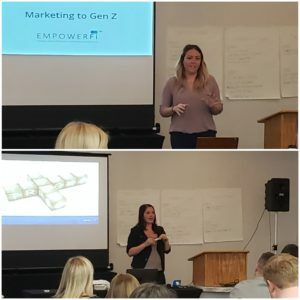 Hilary Reed, CEO at EmpowerFi, led the afternoon session focused on marketing to Generation Z. Her presentation detailed the differences between Gen Z and Millennials and emphasized the importance of communicating with images when marketing to this “on the go” generation. When making decisions, Generation Z is influenced by their parents, price, quality, and the fear of missing out. Sales strategies to reach Gen Z should begin on mobile and include crisp images with short messages. Both presenters suggested using online tools like Google Key Word Planner, Google Trends, and Good Search Console to help with demographic targeting. For more information about the Marketing Council, contact Jen Burke, League Communications and Outreach Manager, at jburke@mainecul.org. The next Marketing Council workshop will take place this summer.